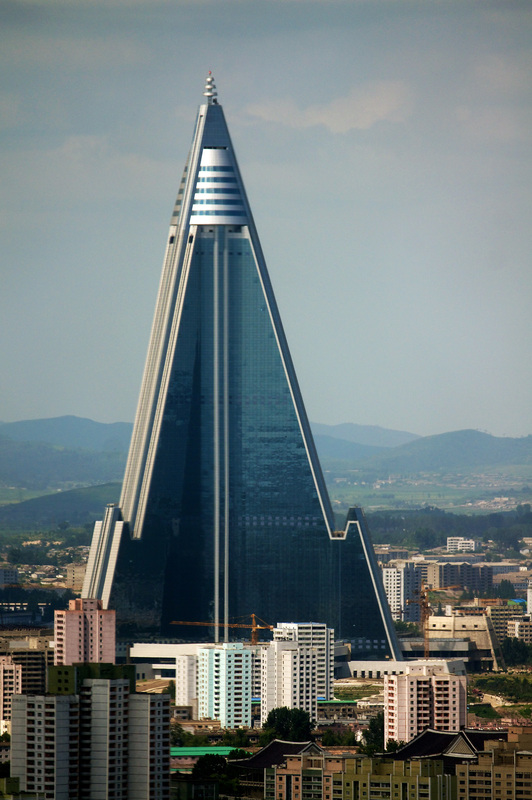 The Ryugyong Hotel is a 105-story pyramid-shaped skyscraper under construction in Pyongyang, North Korea. Its name ("capital of willows") is also one of the historical names for Pyongyang. The building is also known as the 105 Building, a reference to its number of floors. Construction began in 1987 but was halted in 1992 as North Korea entered a period of economic crisis after the fall of the Soviet Union. The Ryugyong Hotel is at height of 330 metres (1,080 ft), making it the most prominent feature of Pyongyang's skyline and by far the largest structure in North Korea. Construction of the Ryugyong was intended to be completed in time for the 13th World Festival of Youth and Students in June 1989; had this been achieved, it would have held the title of world's tallest hotel. The unfinished building was not surpassed in height by any new hotel until the 2009 completion of the spire atop the Rose Tower in Dubai, United Arab Emirates. The Ryugyong Hotel is currently the world's 47th tallest building (alongside the China World Trade Center Tower III) in terms of total height and has the 5th highest number of floors.